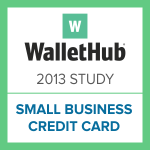 WalletHub’s annual Small Business Credit Card Study examines the extent to which the nation’s 10 largest credit card issuers have proactively extended the most important CARD Act protections to their business-branded cards as well as how closely they tie such cards to the personal finances of accountholders. The CARD Act of 2009 is a landmark piece of legislation enacted to protect credit card users from unfair policies. While it automatically covers general consumer credit cards, the law unfortunately does not apply to small business accounts, despite the close ties between most small business owners’ personal and company finances. Therefore, if a given issuer has not proactively adopted these protections for all of its customers or is not transparent about its policies, small business owners cannot use its business credit cards without worry. Bank of America is the most small business friendly credit card issuer, as it’s the only one to have extended all of the major CARD Act protections to its business-branded cards. Citibank, Discover, U.S. Bank, and Wells Fargo are the least small business friendly credit card issuers, as they have extended fewer CARD Act protections to their business-branded cards than the competition. Every major credit card company holds its customers personally liable for business credit card use. 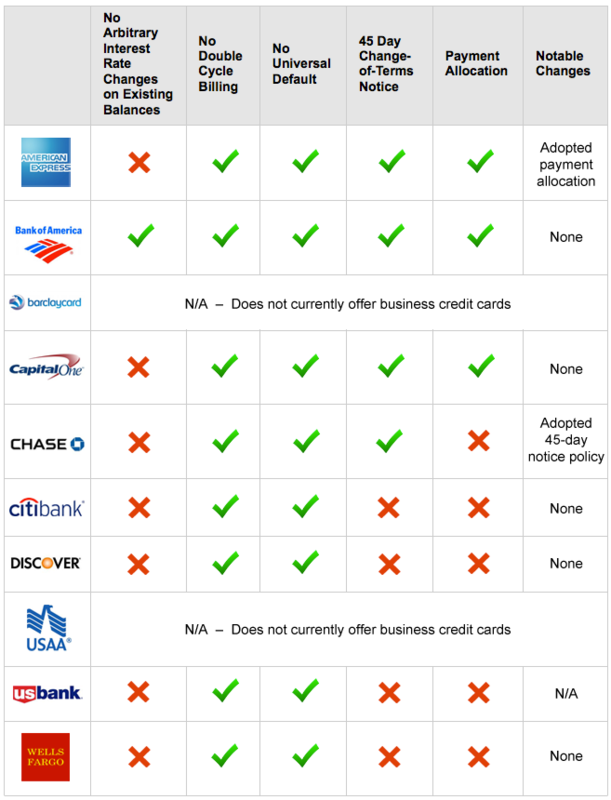 Seven of the eight major credit card issuers that offer business credit cards report usage information to their customers’ personal credit reports. Citibank is the only major issuer that doesn’t report business card usage to customers’ personal credit reports. Every major issuer uses personal credit data to determine business credit card eligibility. 2013 marked the first year in which all major issuers were transparent about their small business credit card policies. All of the major issuers have at least some CARD Act protections, indicating a recognition that the law may ultimately be extended to include business credit cards. 80% of the largest card issuers in the U.S. offer business credit cards. The two that do not are Barclaycard US and USAA. U.S. Bank Yes Yes, when the account is in default 30% Good U.S. Bank participated in the study for the first time this year. WalletHub surveyed the nation’s 10 largest credit card issuers about whether or not they use personal credit report data to make small business card approval decisions, whether or not they report small business account information to users’ personal credit reports, and which if the following important CARD Act protections they’ve adopted: 1) Protection against arbitrary interest rate increases for existing balances; 2) No double-cycle billing; 3) No universal default; 4) 45 days’ notice for key changes to account terms; 5) Straightforward payment allocation. Additional information can be found by checking out last year’s version. The issuers provided the following information to explain their small business card policies as well as mention some of the other CARD Act protections they have proactively adopted. While important, WalletHub did not deem this information essential enough to include in the study’s main findings. American Express: American Express has implemented the following CARD Act regulations: redesigned statements that make information about balances, payment due and interest rates clearer; late payment warnings included on statements; online card agreements; a 25-day grace period between when a bill is made available and when payment is due; uniform payment due dates; deadline for same-day payment processing extended to 5 p.m.
Bank of America: Bank of America has implemented the following CARD Act protections: a 25-day grace period between when a bill is made available and when payment is due, statements that include rates for purchases, balance transfers and cash advances, payment information to keep accounts in good standing and a summary of fees. Capital One: Capital One has implemented the following CARD Act protections: 25% of credit line fee limits, assurance that introductory rates will last for at least six months, uniform statement availability and due dates, the inclusion of required minimum payment on statements, and the abolition of pay-by-phone fees. What’s more, the only way Capital One small business cardholders can trigger the penalty default rate is if they pay late multiple times (by 3 or more days) in a 12-month period. If the cardholder makes 12 consecutive on-time payments, they are automatically returned to their previous rate. Chase: In order to give small business customers increased financial control, Chase voluntarily implemented rules requiring: fixed statement and payment due dates each month; free online and phone payments; minimum payment warnings and late fee/penalty rate warnings on statements; that promotional rates be at least 6 months in duration; that account must be open for 1 year before non-penalty changes to terms; and that customers have the right to reject fees on new accounts. In addition, Chase plans to implement later this year a requirement that necessitates at least 45 days’ notice be given in advance of key account terms being changed. Discover: Discover has implemented the following CARD Act protections: no pay-by-phone or over-limit fees and a 25-day grace period between when a bill is made available and when payment is due. U.S. Bank: U.S. Bank has implemented the following CARD Act protections: Same monthly due date; a minimum 24-day grace period between when a bill is made available and when payment is due; statements that include rates for purchases, balance transfers, and cash advances with corresponding balance details and promotional expiration dates; Year to Date interest and fees summary. Wells Fargo: While Wells Fargo has not fully adopted a few of the most important CARD Act protections, it has taken certain intermediary steps. For example, it will only increase a business cardholder’s APR in the event of two or more delinquencies within 12 months, and customers can return to lower rates when they improve their payment histories and have fewer than two delinquencies in the 12 months following the initial change. In addition, Wells Fargo gives its business credit card customers at least 30 days’ notice before changing key account terms, and customer payments are usually applied to lower-rate balances before higher-rate balances, with the exception of Overdraft Protection Cash Advances, which are paid before any other principal despite generally having higher rates. PREVIOUS ARTICLEWhy Should You Care About Your Credit Standing? To Get a Job, For One ThingNEXT ARTICLE Ask the Experts: Why Do Health Care Costs Vary So Widely?